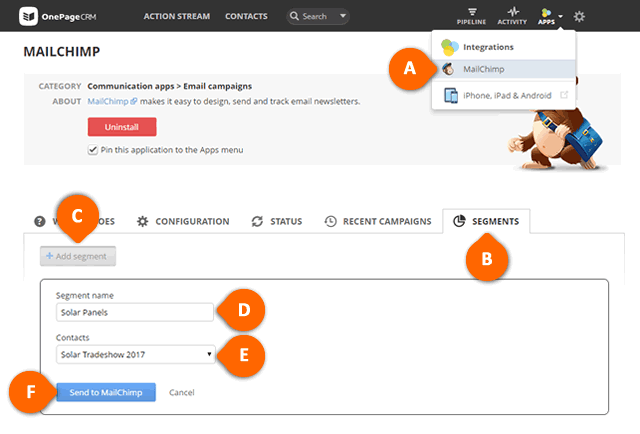 Once the MailChimp integration is installed and configured, you can segment your contact list and view stats of the recently sent campaigns. Segment your contact list in order to send customized newsletters to a selected group of contacts. Adding a segment in OnePageCRM automatically creates this segment in MailChimp. Go to Apps > MailChimp (see A) (provided that you have pinned MailChimp to the Apps menu). Select SEGMENTS (see B) and click Add Segment (see C). Enter Segment name of your choice (see D). Select a group of contacts from the Contacts list (see E). Click Send to MailChimp to push this segment to MailChimp (see F). Once a campaign is created and sent to contact in MailChimp, you can monitor the stats of the sent campaign in OnePageCRM. (see A) (provided that you have pinned MailChimp to the Apps Menu). Select RECENT CAMPAIGNS to view information your recent campaigns (see B). To have MailChimp appear on the drop-down (see A), you must select the checkbox Pin this application to the Apps menu when installing up the MailChimp integration.